I’ve known Mike Curtis for decades, and I want to tell you about him. Mike is charming, he’s avuncular, and he’s a good friend of mine. Our paths first crossed when I was growing up in Tupelo, Mississippi, and we immediately bonded as kindred spirits who loved Superman. Now, I have a pretty impressive collection of Superman memorabilia (and a security system, so step back), but Mike’s collection is, well...super. It runs the gamut from rare comics to ‘50s drinking glasses and board games and pinback buttons right up through items from the next sixty years. Mike was even a dear friend of the late Kirk Alyn, film’s first Superman, which is an honor I can’t claim. In fact, I think the only thing I have that Mike doesn’t is the rare “Superman in the Jungle” 1966 trading card set, and you’ll remember that I mentioned that security system. Opening May 6 (Free Comic Book Day) and on display for the next eight months, the exhibit will be as close to a Superman museum as we’re likely to see in our lifetimes. And Mike, fittingly, will be there for the opening ceremonies alongside members of the Siegel and Shuster Society, a Cleveland organization known for the wide range of Superman-inspired events it’s held for years now. Mike’s one of the most generous men I’ve ever met, and in my eyes, he’s never gotten the attention and notice he deserves for being such an important custodian of the Superman legend. The following interview, conducted in late April, is a step towards fixing that. Mark Waid: Mike, how did your love of Superman come about? What were the origins of your collection? Mike Curtis: When I was a kid, my single mother basically thought I needed a father figure. She sat me in front of the TV and said, “Watch that man in the cape.” That was my introduction to Superman--the original George Reeves television show--and after it was over, she said, “If you’re real good, you can watch it again some time. And if you’re really, really good, they make funnybooks of that person and you can read them anytime you want to.” I couldn’t think of anything better in the world than to have a Superman comic book and read it anytime I wanted to. Waid: That’s great. Other than the comic book, do you remember the very first piece of Superman memorabilia you ever got? Curtis: The Kelloggs’ belt and buckle. You had to mail away for it, send two boxtops and a quarter. Waid: I have one somewhere. It’s vinyl and plastic and as cool as it is, I’ve never in my life been thin enough to wear it. And from there, you never stopped collecting Superman stuff. Curtis: My mother would buy me Superman comic books and occasionally toys, but of course back then, there weren’t nearly as many Superman collectibles as there are nowadays. 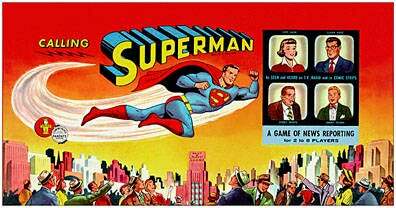 I remember getting a Superman board game around 1960 but aside from that, there wasn’t really much out there. Waid: Not until the success of the 1966 Batman TV show had all comics publishers licensing all their characters like crazy. Even still, there wasn’t nearly as much Superman merchandise as there is today. I’ve landed Superman and Supergirl Halloween costumes and couple more board games over the years, but toys were still scarce. That said, you’ve been collecting all your life. How many items total did you end up with? Curtis: Several thousand. I’m no longer sure of the exact number now that everything’s up in Cleveland. Waid: Were there ever things you got rid of, or did you just keep everything? Curtis: Some things, of course, you couldn’t keep because they eventually deteriorated. Waid: No one needs a 1980s jar of Superman peanut butter around the house right now, agreed. Curtis: Or you played with them and they just got too run down or were too fragile to last but, yeah, I kept most everything I could. Waid: You once sent me a nail--A NAIL--from the house that George Reeves was born in, so I have no trouble believing that. You once sent me a picture of a Superman tablecloth that we decided had to have been from the ‘40s, and God only knows its pedigree. Why was this the right time for you to finally donate your entire collection? Curtis: I’m getting older, and I decided well, it’s time for it to go some place where people will see it for years beyond my time. Honestly, I always collected to exhibit other than to collect, anyway. I’ve always collected with an eye towards things that would be interesting to other people. I think I’ve done probably 30 or 40 exhibits in libraries and colleges and museums all over through the years. Waid: How did the Siegel and Shuster Society hear about your collection? How did they get hold of you? Curtis: You remember Cleveland did a promotion in 1988 for Superman’s 50th Anniversary? Waid: Big convention, big parade! I was there, and it was awesome. I’ve never felt more home anywhere in my life before or since that I did at that convention. Curtis: I think that was the first time I was in touch with the people in Cleveland, and I just kept up with them through the years. Different collectors, different comic book people. My direct involvement began to solidify when I started talking to Michael Olszewsky with the Siegel and Shuster Society three or four years ago, and now the exhibit at the Cleveland Public Library is upon us. Librarian Amy Dawson is my main contact there, and I can’t say enough good words about her. It’s my understanding that the exhibit was originally set for just one area of the library, but once they saw how many rare collectibles they’ve been able to add to my donation it now spans three floors! Waid: What were the challenges of literally boxing and moving everything from your home near Little Rock up to Cleveland? Some of your collectibles must be incredibly fragile. Which ones required the most tender loving care in transport? Curtis: In the 1950s, Transogram made a flying Superman glider out of foam, and that piece is awfully fragile. There was also a large 3-D display advertising greeting cards that was made out of thin plastic, and of course there were a lot of glasses and glassware. The item that worried me most was a 1951 one-sheet [movie poster] for Superman and the Mole Men. It was so fragile that I never had the courage to unfold it to see what it actually looked like! The exhibitors mounted it properly and sent me a photo, which I was glad to see. One of the rarest items in my collection is one I’m taking up personally. It’s a metal Superman trophy from the 1950s. Back in the ‘70s when I was a reporter, I interviewed a woman who worked at a radio station, and she had one, about 13 inches tall. It was some sort of “Super Salesman” award given out to employees. I’d never run across one. I tried my best, but I couldn’t talk her out of it. She let me take pictures, though, and over the next 42 years, I never gave up the hunt for another. [Historian and former DC Comics publisher] Paul Levitz had never seen one. Harry Matesky [author of the invaluable 1988 catalog The Adventures of Superman Collecting] had never seen or heard of it. Even you hadn’t. And I finally found another. I still can’t find out any information about it except that it was manufactured in the 1950s or 1960s, maybe even the 1940s. Waid: Deep in the DC library years ago, I found an undated design sketch that matches it pretty well. The same basic pose was used on the cover of a 25th Anniversary Superman comic, and I’m sure predates that. Mike this is literally the collection of a lifetime. Any second thoughts about donating it? Curtis: No, not really, not if it means people can see it now and long after I’m gone. I’ve never exhibited it in the Cleveland area, Siegel and Shuster’s hometown, so there’s something fitting about it finally ending up there.